Rice straw is the vegetative part of the rice plant (Oryza sativa L.), cut at grain harvest or after. It may be burned and left on the field before the next ploughing, ploughed down as a soil improver or used as a feed for livestock (Kadam et al., 2000). Rice straw is a major forage in rice-producing areas. Rice originates from Asia, where it has been cultivated since 6500 BC, and is now naturalized in most tropical and subtropical regions. Rice grows from 53°N in China to 35°S in Australia. The optimal growing conditions are: 20-30°C average day-temperatures with night temperature over 15°C; fertile, heavy soils; 6.5-7 pH. Most varieties ("swamp rice", "lowland rice") must be planted in stagnant water and require 200 mm rainfall/month or the equivalent amount from irrigation, whereas others ("mountain rice" or "upland rice") require less irrigation and 750 mm rainfall over a 3-4 months period with no desiccation. Rice straw can be treated in order to improve its nutritive value. Those treatments are designed to enhance feed intake and/or digestibility. Improving digestibility may be achieved through mechanical, chemical, heat and pressure treatments. Chopping and grinding rice straw may reduce the time of passage in the rumen and improve feed intake (Doyle et al., 1986). Chemical treatments (NaOH, ammonia, urea) may be hazardous to humans (NaOH is a dangerous chemical if handled wrongly) and animals (heavy urination, faster rumen washout). NaOH treatment consists in soaking the straw in NaOH solutions, draining it and sometimes washing it after treatment. This may cause water pollution. It is also possible to spray NaOH onto the straw and then allowing it to dry. Ammonia treatments are safer and provide nitrogen that is lacking in straw. Ammonia reduces physical strength and disrupts silicified cuticles in leaves. Ammonia treatments can increase digestibility by 31%. Urea treatment is the easiest to apply. It can be done by smallholder farmers using plastic bags, with a 5% urea w/w solution. It can increase digestibility by 18% (Van Soest, 2006). Steam pressure: it releases acetyl groups from the hemi-cellulose, thus increasing digestibility of the rice straw. Association of steam pressure and ammonia: this treatment has been reported to induce severe hyper-excitability in cattle (Van Soest, 2006). 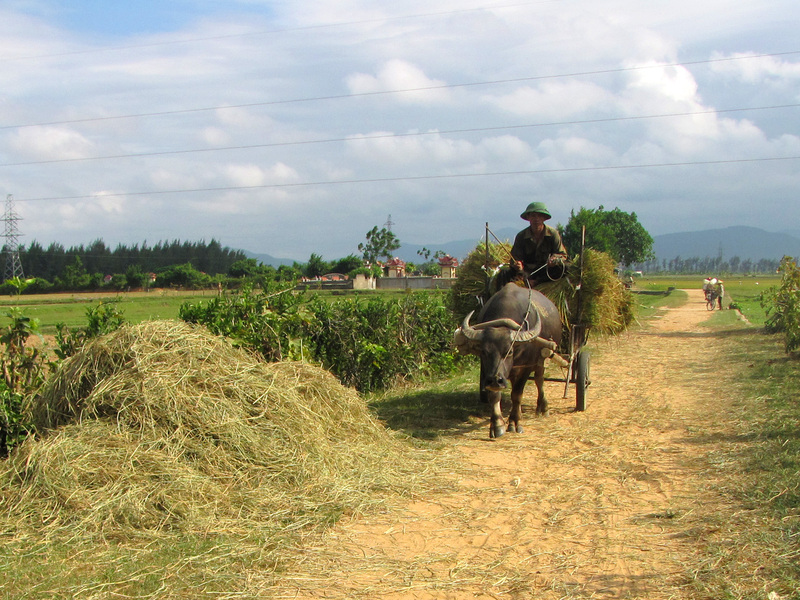 When rice straw is burned or ploughed under, it may cause air pollution or generate leachates. Ploughing under may also propagate fungi (Kadam et al., 2000). Feeding it to livestock reduces its environmental impact and makes the best use of rice as both an energy source and a protein provider. Cattle dung can be burned or composted to benefit from rice energy and to enrich the soil. 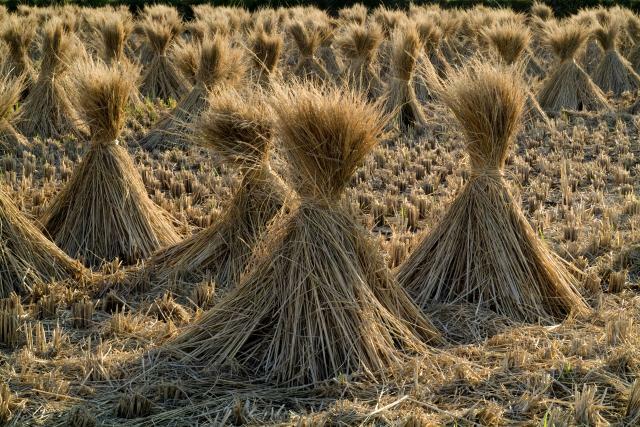 Rice straw contains less lignin than other straws but has a higher silica content. The leaves contain more silica than the stems (Van Soest, 2006). It is, therefore, recommended to cut rice straw as short as possible to increase the proportion of stems (Göhl, 1982; Van Soest, 2006). Silicas are cell-wall bound or soluble. They are excreted in the urine and some calculi may occur but this does not appear to be a serious problem. Rice straw contains high levels of oxalates (1-2% DM), which are known to decrease the Ca concentration, making Ca supplementation necessary (Van Soest, 2006; Jackson, 1979). low energy content compared to maize silage and lower palatability (Odai et al., 2002), resulting in poorer N utilization. When straws are fed to ruminants, the primary limitations to production are low overall digestibility, slow rate of passage in the rumen, low propionate fermentation pattern in the rumen, and low contents of fermentable N and by-pass protein. In extensive systems, the animals are allowed to enter paddy fields after harvest and graze rice straw and weeds in the field or on the roadsides. 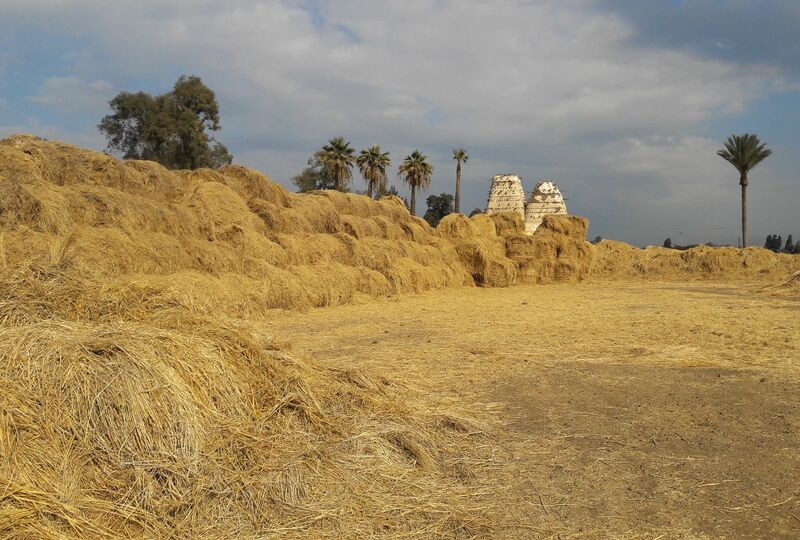 In less extensive systems, the animals are tethered in the paddy field close to stacks of rice straw. 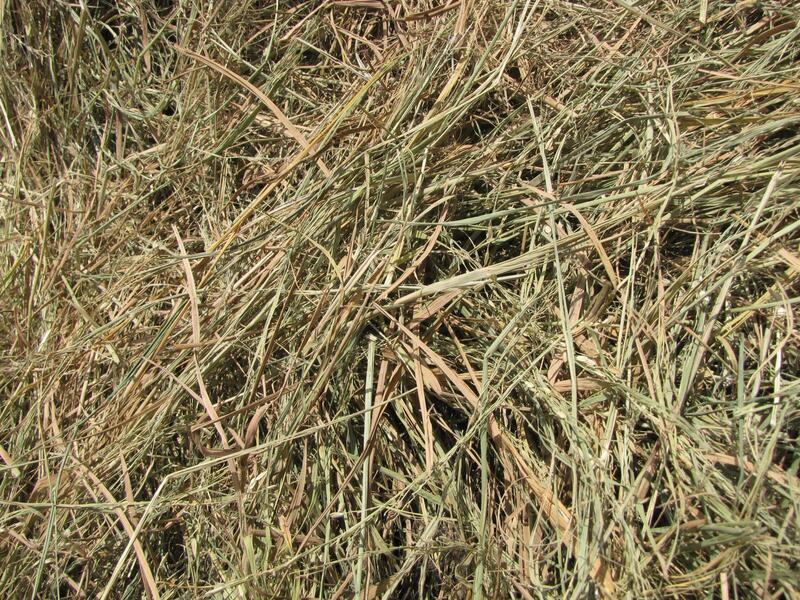 In stall-fed systems, rice straw may be fed alone, or fed with other forage supplements and/or concentrates. 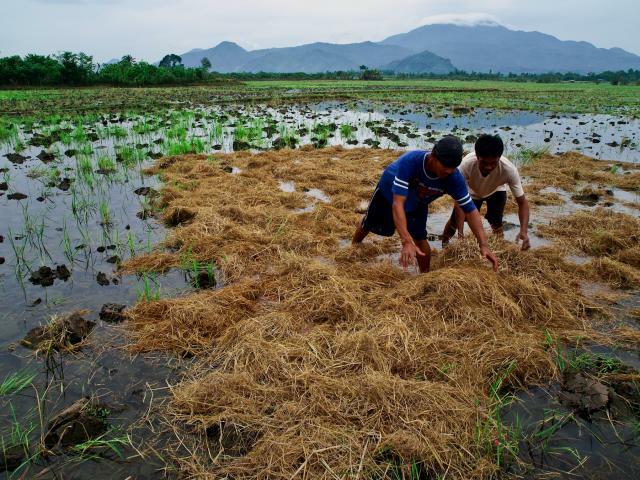 Supplementation is strongly recommended in order to mitigate the nutritional weaknesses of rice straw. In ruminants, when milk or meat production is desired, rice straw must be supplemented with both protein and energy sources. For good growth from straw-based diets, a level of 8 to 10% CP is needed for young stock: this also improves consumption and thus increases energy intake (Jackson, 1979). Legumes are often suggested as supplementary protein sources. Many potential legume supplements have been reviewed and proved to give good results: vetch (Lathyrus sativus) (Akbar et al., 2000), stylo (Stylosanthes guianensis) (Khuc Thi Hue et al., 2008), griffonia (Griffonia simplicifolia) (Oddoye et al., 2005), gliricidia (Gliricidia sepium) (Kusmartono, 2007; Orden et al., 2000), leucaena (Leucaena leucocephala) (Orden et al., 2000), velvet bean (Mucuna pruriens) (Adjorlolo et al., 2001) and tithonia (Tithonia diversifolia) (Premaratne et al., 1998). Other plants may also be used as protein supplements in a rice straw-based diet: cassava leaves or cassava hay (Vongsamphanh et al., 2004; Premaratne et al., 1998), jackfruit wastes (Khuc Thi Hue et al., 2008) or mulberry leaves (Liu et al., 2002). Grasses such as Napier grass (Pennisetum purpureum) are also potential protein supplements (Wittayakun et al., 2005; Kusmartono, 2007; Ngo Van Man et al., 2001). Costlier protein-rich feeds such as rapeseed meal (Liu et al., 2002), soybean meal (Odai et al., 2002) and fish meal may also be used (Khan et al., 1990). Supplementary energy sources include maize silage (Liu XiaoHui et al., 2006), commercial concentrate mixtures (Bhaskar et al., 1992), sugarcane molasses (Nguyen Xuan Trach, 2004), or groundnut haulms (Fayomi et al., 2004). Supplementation may be combined with mechanical, chemical and pressure treatments. Rice straw fed alone proved to be sufficiently nutritious to feed draught cattle during short periods, but did not meet full animal requirements and had to be supplemented with crude protein and minerals, especially P and Ca (Jackson, 1979). In dairy cows fed rice straw, legume protein sources were found to have positive effects on DM intake (Oddoye et al., 2002), milk yield and milk composition (Akbar et al., 2000). Higher feed intake and rice straw digestibility may also be obtained when adding maize silage to rice straw (Liu XiaoHui et al., 2006), or after chemical treatment of the straw. Those treatments (see Processes on the "Description" tab) improved rumen degradability, total digestible nutrients and N retention in cows (Shen HengSheng et al., 2002; Prasad et al., 1998; Ha et al., 1994). Combination of chemical treatments with grass or protein supplements also offers a wide range of improved diets for cows with positive effects on dairy production and feed costs (Wittayakun et al., 2005; Oddoye et al., 2002; Ngo Van Man et al., 2001; Bhaskar et al., 1992; Khan et al., 1990). In dairy heifers, a combination of urea-treated rice straw with cottonseed cake resulted in optimal weight gain and the lowest feed costs. Rice straw mixed with rice bran and urea-molasses improved live-weight gain, weight of calves and milk yield (Hari Singh et al., 2001). In cows and heifers, ensiling rice straw was beneficial to daily milk yield (Chen XiLing et al., 1995) and fat milk content (Ngo Van Man et al., 2001). However, ensiling and fermentation needs caution because damp rice straw has lower DM and overall nutrients, is prone to moulds and possibly aflatoxin contamination in milk (Bhuiyan et al., 2003). In steers, chemical treatments of the rice straw were also shown to increase feed intake and animal performance (Nguyen Xuan Trach, 2004; Cardoso et al., 2004). Supplementation with cassava hay, sugarcane molasses or wet brewers grain also resulted in higher feed intakes and improved digestibility (Vongsamphanh et al., 2004; Nguyen Xuan Trach, 2003). However soy sauce residue as a supplement decreased DM intake (Maliwan et al., 2009). Urea treatments combined with protein supplementation did not give better results than supplementation alone (Nguyen Xuan Trach, 2003). Wood ash or polysorbate 80 (Tween 80®) treatment added to protein supplementation improved DM disappearance and overall nutritive value (Laswai et al., 2007; Lee et al., 2007). Every treatment or supplementation of rice straw in sheep was reported beneficial on feed efficiency and animal performance (Kusmartono, 2007; Oddoye et al., 2005; Premaratne et al., 1998; Abdella et al., 1998; Damasceno et al., 2000; Orden et al., 2000; Harada et al., 1999; Rajeev Pradhan et al., 1996). Only one trial reported a supplement of mature poplar leaves to have no beneficial effect on rice straw value (Paliwal et al., 1993). Ensiling rice straw with Ruminococcus albus and Clostridium cellulovorans increased digestibility and nutritive value (El-Galil, 2008). Lactobacillus plantarum improved total digestible nutrients, digestible energy and dry matter intake (Xu Chun Cheng et al., 2006). Other attempts were less successful: fermenting rice straw with Flammulina velutipes had no effect on Hanwoo sheep intake or performance (Shinekhuu et al., 2009). As mentioned above, ensiling rice straw with mature poplar leaves did not ensure sheep maintenance (Paliwal et al., 1993). Combining treatment and supplementation gave positive results, as reported in the following table. Supplementing rice straw with cassava leaves or apple pomace and/or treating rice straw gave better intake, N retention and daily weight gain (Ho Quang Do et al., 2002; Jo IkHwan et al., 2002). Rice straw fermented with white rot fungi was given to pigs with no deleterious effect on performance and feed conversion efficiency (Chen Yi et al., 2004). Rice straw can replace alfalfa in pelleted diets (Ferrero, 1993). 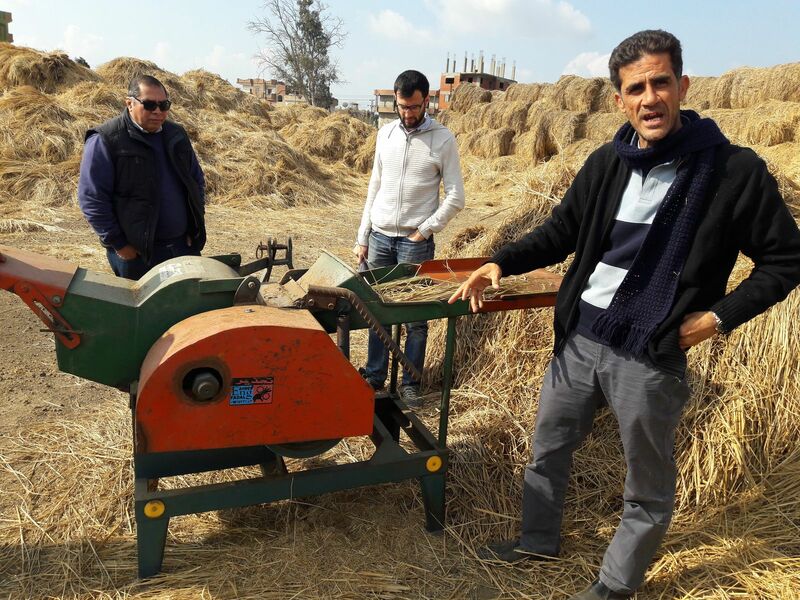 Inclusion levels as high as 30% were possible without altering animal performance when NaOH-treated rice straw replaced alfalfa (Masoero cited by Lebas, 2004). 15% rice straw + 10% molasses have been recommended in order to decrease feed costs (Sfairopoulos et al., 1987). Rabbits may be fed on rice straw, treated or not, inoculated with Coprinus fimetarius without deleterious effects on rabbit performance (Deodhar et al., 1991). Rice straw is mainly used as a fertilizer for ponds (rice straw is included at 5-10% of the compost) in fish farming (Hasan et al., 2007).